2 king beds and 1 sleeper sofa - Private Well Appointed Home on Canyon Road! 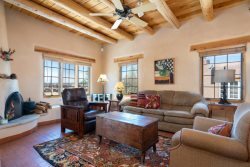 If you are looking for elegant Santa Fe style in a great downtown location, Casa de Maria is the perfect vacation rental for you. Located in the historic Eastside, Casa de Maria is within easy walking distance of the shops, galleries and restaurants of Canyon Road. The home is bright with French doors and large windows throughout. Both bedrooms have en suite bathrooms and are decorated with elegant Santa Fe touches. The master bedroom features a king-size bed, a flat screen television with cable connection, high speed internet, and master bathroom with a stand up shower. The guest bedroom also offers a king-size bed, flat screen television, bathroom with a tub/shower combination and a washer and dryer. The high-ceilinged living room and dining room (with formal dining table that seats six) offer a great, open space for relaxed entertaining. The gourmet kitchen is fully equipped with a Viking range and Sub-Zero refrigerator. Stylish furnishings and artwork are found throughout the house. The home's ideal southern exposure and landscaped garden provide the perfect setting for enjoying the wonderful Santa Fe sunlight. The garden and outdoor living space are perfect for enjoying the Santa Fe sky, by day or night. Can be leased with Casita Milagro, Casita de la Artiste, Casa Pequeno together or separately for a five bedroom compound that sleeps 12-14 people. Approximately 1,500 net square feet. Special Note: Cocktail "Fire Table" and "Fire Pedestals" require special fuel. Guests must order fuel on RealFlame.com or Amazon.com at least 7 days before to arrival. Ship fuel to Casas de Santa Fe for Guest Arrival. We are frequent visitors to Santa Fe, but never used your services. We will do so again! This was favorite casa over previous 2 (Escondido and Johnson lane)... hope to rent something in Tesuque next year for a month with mountain views.